[The Bohr model] scored a stunning success in accounting for major features of the observed spectrum of the hydrogen atom. "As soon as I saw Balmer's formula, the whole thing was immediately clear to me." How logically neat it would be if Balmer's simple formula had, out of the blue, led Bohr directly to his model of the hydrogen atom. Unfortunately, neat logic must give way to the reality of events as they occurred. Bohr did see Balmer's formula, he did make the statement quoted above, and he did proceed to develop his model of the hydrogen atom quickly. When Balmer's formula came to Bohr's attention, however, he was already deeply engaged in an intellectual struggle to develop a model of the hydrogen atom that, among other things, explained its spectral behavior. Bohr's recognition of the significance of Balmer's formula is a classic example of the prepared mind. Niels Henrik David Bohr was born in Copenhagen, Denmark on October 7, 1885. Christian Bohr, his father, was a professor of physiology at the University of Copenhagen and his mother, Ellen Adler, came from a prominent Jewish family. Niels had one older sister, Jenny, and one younger brother, Harald. The family home was a place where Professor Bohr and his university col leagues gathered and young Niels was exposed to the ideas that animated intellectual discussions during the concluding years of the nineteenth century. The time of his birth was auspicious for a budding physicist: when Niels Bohr received his doctorate in 1911, the world of physics was pregnant with potential. One of those whose discoveries prepared the field for Bohr and others was J. J. Thomson (1856-1940), who in 1884, at the age of twenty-eight, became Cavendish Professor of Experimental Physics at the University of Cambridge, following in the steps of James Clerk Maxwell (1831-1879) and Lord Rayleigh (1842-1919). In 1897, J. J. Thomson discovered "matter in a new state" and with this discovery it was clear, as Thomson wrote, "the subdivision of matter [had been] carried very much further. "1 Thomson's new state of matter eventually became the electron, and with its discovery most physicists understood that the atom had inner parts. Thomson's experimental measurements gave a single number that represented only the ratio of the electron's mass divided by its charge, m/e; thus Thomson could establish neither the electron's charge nor its mass separately. Thomson's data, however, provided two important clues. Hydrogen provided one of them. Thomson's result showed that the mass-to-charge ratio of hydrogen, as determined by electrolysis experiments, was 1,000 times larger than the same ratio for the electron. This allowed Thomson to conclude that the smallness of the electron's m/e ratio was due to either the smallness of m or the largeness of e (or a combination of the two). The second clue was that the ratio m/e had a negative value. Since mass is always positive, this meant that the charge carried by the electron was negative. "is a piece of matter with shape, motion and laws of action, intelligible subjects of scientific investigation. "2 It went without saying that the "laws of action" would have to provide an explanation for the characteristic spectral emissions, such as the Balmer series, associated with atoms. There were two major problems with these early, many-electron models of the atom. First, atoms are electrically neutral. What provides the positive charge required to neutralize the negative charge of the electron? As there was no evidence on which to base a definitive response, physicists at first largely finessed this question. The second problem was the inherent instability of the many-electron models. Since atoms are stable, any tenable model of the atom must account for its stability. An atom made up of 1,000 electrons, each repelling all others, works against stability. The question, "What is the origin of positive charge in the atom?" is accompanied by another question: "What is the form of the positive charge and where is it located relative to the negative charge?" In 1902, Lord Kelvin proposed that the atom consisted of a sphere of positive charge in which the electrons were embedded. In the following year, J. J. Thomson elaborated on Kelvin's idea by considering the stability of such an arrangement and, perhaps because he was so eager to find a suitable model for the atom, he found what he considered a hint of stability. In any event, the name of Thomson has become associated with the "plum pudding" model: negative electrons leavening a spherical batter of positive charge. In 1906, Thomson made perhaps his greatest contribution to the pursuit of an atomic model. With several lines of reasoning, Thomson concluded that the number of electrons in an atom was approximately equal to an atom's atomic weight. On this basis, there would be only one electron in a hydrogen atom. A principal line of reasoning employed by Thomson involved hydrogen itself; namely, he derived a theoretical expression for the index of refraction for a monoatomic gas and when his result was compared with experimental data for hydrogen, the result suggested that the number of electrons per atom of hydrogen must be approximately equal to one. The plum pudding model, a batter of positive charge with minute negative currants embedded in it, appeared to be consistent with experiments which showed that a beam of electrons could pass undeflected through a thin metallic foil. In other words, one might conclude, as Philipp Lenard (1862-1947) did in 1903, that the atom was mostly empty space. These data as well as the larger question about the inner structure of the atom prompted a most provocative line of experimentation by Ernest Rutherford (18711937). Manchester University was the site of these historical experiments, which Rutherford initiated soon after he arrived in 1907 to assume his responsibilities as Langworthy Professor of Physics. Rutherford liked alpha particles. After all, he had discovered them in 1898. In 1908 he established that the alpha particle carried a double positive charge. Long before he had the experimental proof, Rutherford seemed to know that the alpha particle was a doubly charged particle associated with the helium atom. 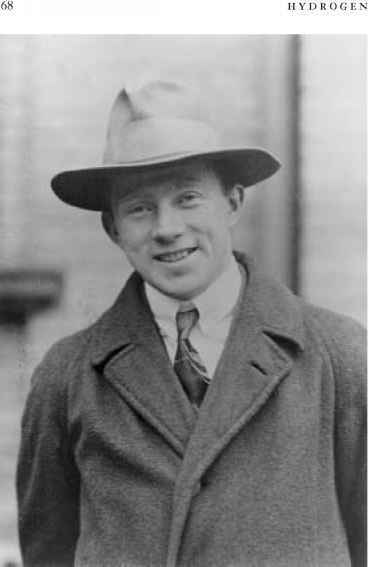 Rutherford and his assistant Hans Geiger directed a well-defined beam of alpha particles at thin foils of aluminum and gold. Figure 4.1 Alpha particles incident, from the left, on a gold foil. Most particles, like the A's, pass directly through the foil. A few particles, like the B's, are slightly deflected. A very few particles, like C, appear to bounce off the gold foil. Most of the alpha particles passed straight through the foil (see Figure 4.1, label A), but some of them were scattered through a small angle (Figure 4.1, label B), especially from the foils composed of gold atoms. What in the atom of gold with its misty positive cloud and its tiny electrons could scatter the more massive, fast-moving alpha particles? Rutherford made a suggestion to Ernest Marsden, an undergraduate who was helping Geiger. Rutherford's suggestion went something like this: "Why don't you see if some alpha particles are scattered at large angles" (Figure 4.1, label C)? With Geiger looking on, the young Marsden pursued Rutherford's suggestion. The results were astounding: some alpha particles actually bounced off the gold foil in the general direction from whence they came. The effect was small: only about one alpha particle in 8,000 was reflected by the foil. But the implication of this small effect was clear: The alpha particle was hitting something substantial in the atom. Rutherford published the results of these scattering experiments in mid-1909, and it seemed as if publication of the discovery of the nuclear atom would soon follow. But the plum pudding model remained the working model of the atom. Through the rest of 1909 and most of 1910, Rutherford pondered. Rutherford's atom consisted of a positively charged center some 10,000 times smaller than the atom itself. This center also carried most of the mass of the atom. For the gold atom, he found the charge at the center to be approximately 100 times the charge of the electron. Surrounding this center of positive charge were the electrons (see Figure 4.2). In March 1911, this new model of the atom was conveyed to the community of science. Later, in October 1912, Rutherford used the term nucleus for the first time. Figure 4.2 The nuclear atom of Rutherford. 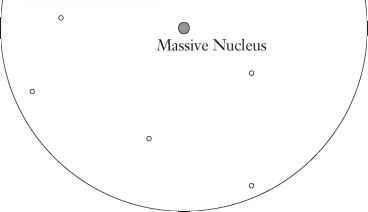 The electrons were distributed within a sphere surrounding the massive nucleus. No electron orbits were specified. same lecture.5 Bohr had recently begun his postdoctoral research at Cambridge University under the direction of Thomson. 1912 and he worked on the absorption of alpha particles by aluminum. However, his heart was not in experimentation. Other ideas were commanding his attention. By the time he left Manchester to return home four months later (July), these ideas were maturing. More than any other person, more than any other physicist, Bohr was the guiding spirit of the quantum revolution. Bohr was not one of the physicists who, in the mid-1920s, created quantum mechanics: Bohr was not adept at creating the formal mathematical structures that were required. Unlike most physicists, Bohr's reputation did not emanate entirely from the papers he wrote. Yet, Bohr's contribution to twentieth-century physics is acknowledged by most physicists as second only to Albert Einstein's. Hydrogen: one negative electron and a positive nucleus. How does it go together? With hydrogen as his focus, Bohr confronted directly the problems inherent in the Thomson model and the nuclear model of Rutherford. The first problem was that both Thomson's plum pudding and Rutherford's nuclear models were neither mechanically nor electromagnetically stable. Electrons moving within Thomson's positive cloud or around Rutherford's nucleus continuously lose energy through the radiation of electromagnetic energy. This energy loss would be catastrophic: atoms would collapse and cease to exist. "stationary orbits" in which, he asserted, "there is no energy radiation," thereby violating the established tenets of nineteenth-century electromagnetism. Bohr recognized that the beautifully conceived and well-confirmed laws of seventeenth-, eighteenth-, and nineteenth-century physics could not apply within the atom. With bold recklessness, he selectively ignored the established laws of physics. "Whatever the alteration in the laws of motion of the electron may be," Bohr wrote at the beginning of the first paper of the Trilogy, "it seems necessary to introduce ... the elementary quantum of action." With this sentence, Bohr placed the dynamics of atoms on a new foundation—a quantum foundation. The Bohr hydrogen atom was founded on new physical ideas in which quantum conditions dictated restrictions on the older laws of physics. Bohr acknowledged a force—an attractive electrical force—acting between the negative electron and the positive nucleus. Bohr also acknowledged that an electron in orbit around a nucleus possesses energy and in terms of the Newtonian laws of physics, he could express this energy. This was Bohr's starting point. But immediately, Bohr placed a quantum condition on the energy; namely, he asserted that only certain energies are permitted. He identified these allowed energies as states of the hydrogen atom. The quantum condition restricted the possible energies as well as the possible orbits of the electron. Only certain orbits were allowed. The larger the energy state of the hydrogen atom, the bigger the orbit. We can picture Bohr's hydrogen atom as a family of discrete orbits surrounding a central nucleus. The smallest orbit has the smallest energy; the next larger orbit, has the next larger energy, and so on to larger orbits and larger energies. In Figure 4.3, the principal elements of the Bohr model of the hydrogen atom are shown. with the smallest energy. The hydrogen atom normally exists in the least-energy state; hence, the orbit associated with this state determines the size of the hydrogen atom. 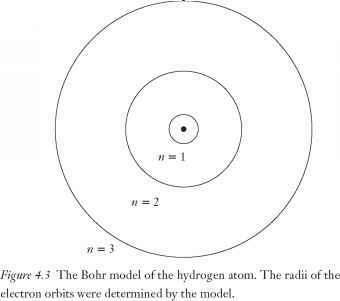 From his model, Bohr was able to calculate the radii of the various orbits and thus, from the radius of the smallest orbit, he could calculate the diameter of the hydrogen atom and hence, its size. The dimension of the hydrogen atom, as Bohr calculated it from his model, was 1.1 A (1.1 X 10-8 cm). The experimentally determined diameter of the hydrogen atom is about 1 A (1 X 10-8 cm)! Bohr had to be gratified and encouraged by this result: his model-generated diameter essentially agreed with the measured diameter of the hydrogen atom. Bohr was also able to calculate the ionization potential, which is related to the energy that is required to pull the electron entirely away from the nucleus. Once again there was essential agreement: thirteen volts (Bohr's calculated value) versus the experimental value cited by Bohr in the second paper of his Trilogy, eleven volts. E2 - E1 = hf where E2 is the larger energy, h is Planck's constant, and f is the frequency of the emitted light. 2] 2 n h where m = the mass of the electron = 8.85 X 10-28; e = the electric charge of the electron = 4.7 X 10-10; h = Planck's constant = 6.5 X 10-27; and n = an integer = 1,2,3,... The negative sign in the energy expression simply indicates that the electron is energetically bound to the nucleus. 2 2 : m —n and his expression. In any event, it became clear to Bohr that the spectral lines in the Balmer series originated when the hydrogen atom emitted light whose energy, expressed as hf, was equal to the energy difference between two allowed energy states. It is interesting to recognize that Bohr's creative imagination failed him in one significant instance. In 1905, a paper by Einstein m was published in which he argued for a quantum view of light in which light was corpuscular in nature. Bohr, along with many other physicists, rejected Einstein's light-quantum idea and continued to do so until the early 1920s. So while Bohr adopted Planck's quantum idea, he rejected Einstein's. Had Bohr accepted a corpuscular view of light, he might have created a more physically picturesque model, thereby anticipating the form his model took within a few years of the 1913 publication. For example, later in 1913, an illustration of Bohr's model appeared that subsequently was used by Arnold Sommerfeld in his 1919 textbook on atomic structure and atomic spectra—the primary reference in the field for a period of a dozen or more years. 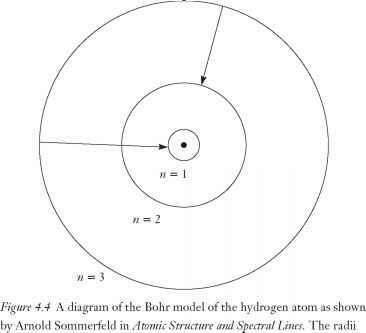 Sommerfeld wrote that the diagram "summarizes" the Bohr model of the hydrogen atom. Sommerfeld's figure, similar to that in Figure 4.4, along with the energy-level diagram in Figure 4.5, are essentially the diagrams used by contemporary physicists to represent quantum transitions. Yet, Sommerfeld himself vacillated about the corpuscular view of light. Although he cited Einstein's view, he did not come out clearly in favor of it. Bohr's unwillingness (along with his contemporaries) to accept Einstein's powerful idea notwithstanding, his accomplishment was truly magnificent. He created the first theoretical model of an atom that gave quantitative results for its physical properties: size and ionization potential. He created the first theoretical model of an atom that provided a mechanism for the origin of spectral lines, and it also gave quantitative results. In all cases, the numbers calculated from Bohr's model were in close agreement with experimentally measured numbers. of the pictured orbits n = 2 and n = 3 are four times and nine times larger than the radius n = 1. Orbits for n = 4, 5, 6, and so on are even larger. Spectral lines originate when the atom passes from one energy state, n = 3, to others, n = 2 and n = 1, as pictured. Bohr's model and voice their confidence in an older, more familiar physics. Changing one's commitment from one conceptual scheme to another can involve an intellectual and emotional uprooting comparable to changing religions. Figure 4.5 The energy-level diagram from the Bohr model provides an explanation of the Balmer series. Not drawn to scale. UiJH= ir'JEPü-LEVtLi electron leaves one energy state, how does it know where it is going? Rutherford saw this as a "grave difficulty." Bohr focused his attention on any atom other than hydrogen, he would have failed. There was one additional shortcoming with Bohr's model. In 1891, Albert Abraham Michelson discovered that the first Balmer line, called Ha, with a wavelength of 6,562 A, was not one bright line, but two lines with almost equal wavelengths, very close together. Their discovery was made possible by the highly refined optical method Michelson applied to his observation of the Balmer spectral lines. This doublet structure of the Balmer line Ha could not be accounted for by Bohr's model. In spite of the shortcomings of Bohr's model, the legacy of Bohr's atom is pervasive. We still talk of energy states of atoms. Our basic understanding of atomic and molecular spectra rests upon Bohr's idea of quantum transitions between energy states. And it was the success of Bohr's hydrogen model that affirmed the need to develop a new physics for atoms. How to draw a bohr model of hydrogen? Which lines series can be accounted for by bohr model? Why does neil bhor uses the term "hydrogen atom"? When was the bohr model discovered?